After four days of play the 2012 PokerStars European Poker Tour (EPT) Deauville is down to just three tables, a total of just 24 competitors. Sitting in the driver’s seat heading into the penultimate day is Team PokerStars Pro and Italian poker legend Luca Pagano who amassed a massive chip-stack of over 3.5 million on Day 4. With a total field size of 889 players registering over the two Day-1 starting flights the EPT Deauville Main Event features a total prize-pool of over €4.6 million, with a first place prize of €875,000 (over $1 million USD) going to the winner of the tournament. Last year it was Frenchman Lucien Cohen who battled through a similar sized field of 891 runners to capture the EPT Deauville Championship after defeating EPT Player of the Year contender Martin Jacobson in a heads-up duel for the title. Pagano holds nearly a 1 million chip-lead over his nearest competitor, Olivier Rogez, who is sitting on a chip-stack of 2.6 million. Further down the leader-board is the very dangerous Lock Poker Pro Kevin Vandersmissen. The Belgian made his mark on the European poker scene last year when Vandersmissen finished second in the EPT Snowfest after a thrilling heads-up battle with another ultra-aggressive youngster in PKR Poker Pro Vladimir Geshkenbein. Pagano accumulated a top 10 chip-stack throughout the day, but in a single hand he went from contender to front-runner when he went toe-to-toe with another big-stack after flopping a set of 6’s and turning a full-house on an A-6-7-A-T board, with his unfortunate opponent holding A/J. While he might be overshadowed by some other Italian poker pros like Dario Minieri and Allessio Isaia,Pagano is definitely a force to be reckoned with in any tournament he enters. 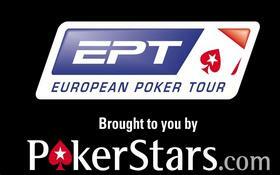 Pagano has already made six EPT final tables in his career and has an astounding 19 cashes in EPT Championship events. Thus far he has yet to capture an EPT title (His best finish is a 3rd place showing in the 2004 EPT Barcelona); his biggest cash to date was a 6th place finish in the 2008 EPT Grand Final in Monte Carlo. With nearly $2 million in career tournament earnings, Pagano is ranked 6th on the all-time money list for Italian poker players. The remaining players will be back at the poker tables at Noon local time where they are expected to play down to the final table of eight players. This entry was posted on Sunday, February 5th, 2012 at 8:48 am and is filed under Poker News. You can follow any responses to this entry through the RSS 2.0 feed. You can leave a response, or trackback from your own site.